Need your parents to send you some cash? Do you pay the rent and have your roommates pay you back their share? Oh perhaps a friend/family member just simply owes you money but just don’t want to have to deal with receiving and depositing a check? Well, you can now (at least, as of 6/3/09) send and receive “personal” payments via PayPal which will not result in any PayPal fees (and you don’t need to have a separate personal/business/etc account – at least I don’t)! Needless to say this was exciting to find out – now I can lend (and borrow) from friends/family, instantly, for free! Personal Transactions. 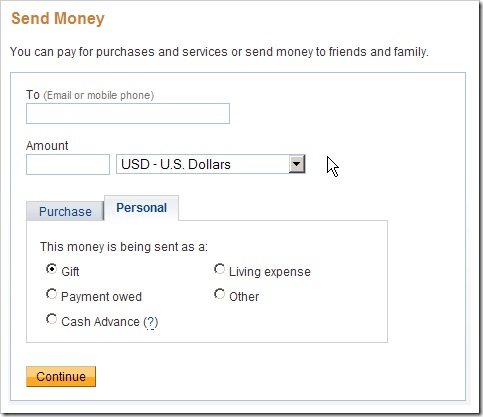 Fees depend on the payment source that the sender selects. The amount of the fee will be shown at the time the payment is sent. The Fee is paid by either the sender or the recipient. The sender decides who pays. Domestic Personal Transactions – U.S. sender and recipient. International Personal Transactions – The sender or recipient is outside the U.S. 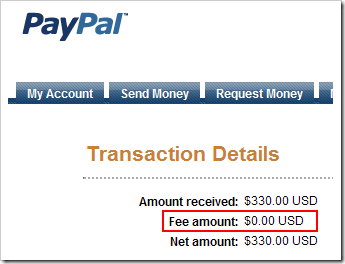 This fee is based on the country of the recipient. So if you need money from (or need to send to) a friend, there’s no reason to have to wait the time for a check deposit or to only deal with local friends and family – use PayPal and save time and hassle! This is cool! I never knew! So it really not free, you actually paid for big transfer.